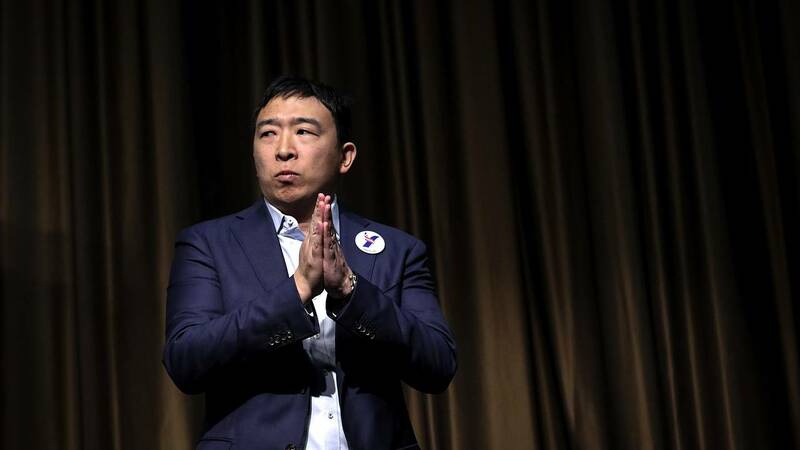 Andrew Yang, a long-shot candidate for the Democratic presidential nomination, has won some attention in the national political debate in recent months thanks in part to a fervent online support network called the "Yang Gang" that pushes support of the candidate on several social media platforms. But the campaign's internet-driven momentum and Yang's signature policy position — that the U.S. government should provide a universal basic income of $1,000 per month to every American adult — have also attracted some of the web's most politically extreme fringe groups, often alt-right users from the fringe internet forum 4chan who express racist views. Yang has publicly disavowed this support, leaving staffers and supporters to play a delicate game of embracing some online promoters while distancing themselves from others. In one room, moderators that run the chat have had to post rules like "no slurs, no racism. I see it, you get one warning then you're gone." According to transcripts acquired by NBC News from a member of the chat room, the discussions have included debates on the merits of support from the alt-right and whether sentences like "jews aren't humans," which was posted and deleted from one chat, are allowed in any way among supporters. Yang, a 44-year-old entrepreneur and first-generation American born in upstate New York, announced his candidacy in late 2017, far earlier than most other candidates. And though he had far less name recognition than other candidates, his popularity on the internet — driven in part by an appearance on the podcast of Joe Rogan, who is particularly popular on Reddit and 4chan — has given his campaign a significant boost. Rogan is a comedian and mixed-martial-arts commentator with strong libertarian leanings who supported Gary Johnson for president in 2016. While Yang's politics don't mirror those of the internet's fringe, his basic income policy and efforts to find common ground with figures like Rogan have given him a dose of internet street cred. The one thing about Yang that does appear to resonate uniformly is his signature policy position — a universal basic income of $1,000 per month given to every American adult. "You can't give them an inch." The internet's embrace of Yang has drawn comparisons from experts and internet denizens to the online support that Trump received in the run-up to the 2016 election, who point to the emergence of Yang-based memes, which are usually altered pictures with political messages. In an interview with NBC News, Yang said he was "frankly mystified" by their support. None of his policies have touched on the issues that galvanized Trump's online support, such as immigration or nationalism. "I've already disavowed any racist or hateful supporters. I don't want that support. At the same time, I'm not participating in those channels," Yang said. "The main thing we can do is highlight how my ideologies are the antithesis of what [those groups] stand for." Whitney Phillips, an assistant professor of communication and rhetorical studies whose research focuses on internet trolling campaigns and the alt-right, said the campaign by 4chan trolls to hijack Yang's support base reminds her of Trump's alt-right support in 2016, except "a little more dangerous." "A lot of people think lower-level trolling is fine. The issue is you can't give them an inch," said Phillips. "There's a small number of people who know which buttons to push to slowly radicalize people to these racist messages. And they've been pushing the same exact buttons for ten years." Transcripts of a chat on Discord provided to NBC News reveal a complicated picture of supporters trying to expel Yang's racist supporters without inviting backlash from one of the most toxic parts of the internet, while also coordinating with Yang campaign staffers. Users in the chat, called "Andrew Yang 2020" — where supporters discussed the anti-Semitic comments and where to draw the line on them — were frequently told to "check in with Carly," a reference to Yang's deputy chief of staff Carly Reilly, and many report back with responses from the campaign. Those conversations included everything from recommendations to consolidate two separate "Yang Gang" support groups to getting sign-off on creating "a nationwide Yang Gang for martial artists." People in the Discord chat said Reilly approved both. Reilly did not directly respond to a request for comment. The transcripts of the Discord group span from its creation in August 2018 to March 2019, and show members frequently compiling ideas and sending them to members of the campaign — and expressing concern that the chat and Yang's campaign were beginning to attract far-right internet trolls. One chat room run by the group called "Fight Club" was designated for fights that may have become too problematic for the general campaign chat. The split proved difficult to moderate, with moderators posting a rule in the general campaign chat: "no slurs, no racism. I see it, you get one warning then you're gone." Yang campaign director Zach Graumann said that the campaign worked with some individuals in the Discord chats, but that the campaign itself was "not actively in that group at all" outside of Reilly's account. Graumann said he worked with one volunteer who happens to be a frequent poster in the Discord on a 3,000-person meet-up in San Francisco, and that the campaign interacts with "a lot of these online forums" but not on a "direct level." "What we stand for is very, very clear. There's no signaling; no ulterior motives. We're trying to make the country whole for your kids and mine," Graumann said. "We said, 'If someone is not living up to our values, kick them out.'" By early March, some users on the campaign-tied Discord began to accept that members of 4chan's far-right politics board, called /pol/, had infiltrated the group, although reactions to their pervasiveness were mixed. Several users in the chat saw similarities between Trump's base of internet support in the run-up to the 2016 election and Yang's emerging support. "This is exactly what the Trump grassroots looked like in 2016," wrote a user in one of the chats. But the Yang campaign's efforts to keep extremists at bay showed some signs of success. Transcripts of a separate Discord chat called "Yang Gang 2020" acquired by NBC News show some fringe supporters expressing frustration that the campaign has been unwilling to engage with them, highlighting how the internet is a double-edged sword for the Yang campaign. "Why is the official Yang discord shooting themselves in the foot?" a user on the 4chan-based board asks. "Don't they realize we are in control of the memes and they can't win without us?"